(scroll down to bottom of page). I just finished reading Getting Your Financial House in Order. Wow! I must say without reservation, this is the best book on financial planning I've read. The parallel used throughout this "biblically-based blueprint on finances" creates a brilliant word picture that offers a realistic challenge. Yet it's more than just a book on financial planning and repair. It ministered to my spirit in many other areas as well, offering a balanced approach to everyday life. This book kept disappearing off my desk as one person after another - from twentysomethings to midlifers - kept asking to borrow it! Whether the reader is a young adult just starting life in the "real world" and hoping to build his financial "dream house" or an older person whose finances are in need of repair, this book will offer the tools and materials necessary to get the job done. The book is practical, insightful, and well written. 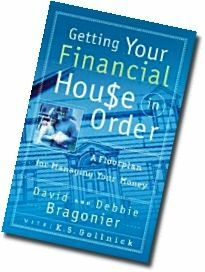 The authors use a word picture of building, repairing, and maintaining a financial house, making money matters interesting and easy to understand. Tools for this work are supplied with a strong emphasis on Biblical principles. "Plumb Line Principles" scattered throughout the book highlight Scripture verses that apply to each chapter's focus. . . .This book was well-researched and includes valuable statistics and personal experiences. Written in an easy-to-read and an easy-to-understand style, Getting Your Financial House in Order offers hope for those who have let their finances get out of hand and guidance for those who know little about finances (you'll know much more when you finish this book!) I recommend it highly. Read more reviews of this incredible book, GETTING YOUR FINANCIAL HOUSE IN ORDER (ISBN 0805427201) published by B&H Publishing Group.